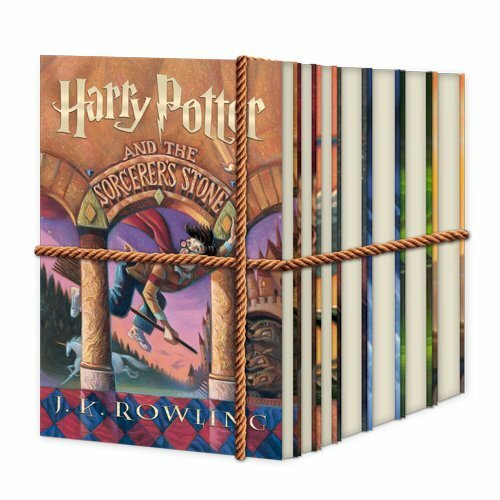 The complete collection of the eBooks in the Harry Potter series. Please note, the seven eBooks are downloaded separately. lofotr (Grade: A+) Rowling has, in my opinion, improved on the literary style used by Roald Dahl and similar writers. Characters are more complex and the themes are deeper and interchanged; By looking carefully you will find many of the themes influenced by some strong philosophy. And all of this happening in a highly imaginative and absurd world. Rowling Is my living proof that a world of magic can describe aspects of or own, better than we can do without. NekroMarshall (Grade: A+) What can I say that hasn't already been said? These are phenomenal reads. I held off from reading Harry Potter because I thought they were nothing but over hyped trash for children. I was very wrong! The first few books are a little on the children's literature side, but they are still great stories that set the overarching plot up well. The later books have a much darker tone and culminate in a great climax. If you think these are just kids books, give them a read, you will be surprised. yeahitskonnor (Grade: A) Like many other readers, I found the first books less enjoyable, but I believe that is simply due to the fact that they are meant for children, and as Harry and his friends grew, so do the themes, narrative, writing, and conflict. Book 4 is a turning point, the end is brilliant. I think that this series deserves the praise, movies, a theme park, and everything! daniellen (Grade: A+) I have like 60 books waiting to be read on my bookshelf. Mostly because I keep going back and rereading these for the umpteenth time.